Carlton Farms products are perishable food items. 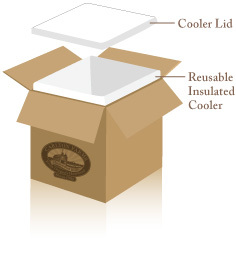 To ensure the quality of the product, we ship all orders in insulated coolers. Our products are vacuum packed and quick flash-frozen to ensure quality. Carlton Farms’ superior method of packaging greatly increases the amount of time the product can remain safely in the freezer. All orders are shipped Monday through Wednesday via UPS. Orders received after 4 p.m. PST (Pacific Standard Time) will be sent the following day. Orders received Wednesday through Sunday will ship the following Monday. All orders are sent via UPS two-day service. Next-day or Saturday delivery arrangements can be made by calling 1.800.932.0946. Your shipment tracking number will be available once the order ships. We guarantee that our products are of the highest quality and will arrive safely, if the correct address has been provided. While our products can safely remain in the supplied containers for a short time, we highly advise that the product be placed in a freezer or refrigerator as soon as possible, preferably within a few hours of delivery. If container damage has occurred during shipment, please contact our customer service representative at 1.800.932.0946 Monday through Friday between 7 a.m. and 4 p.m. PST. Due to the nature of the product, we cannot ship any products to Canada, other foreign countries, or to APO, FPO, and PO Box addresses.